Let’s be honest. Bread pudding is not the most appetizing name for a dessert. For me, at least, it doesn’t conjure the same kind of mouth-watering thoughts as, say, pie… or cupcakes… or triple chocolate fudge brownie. For some people, though, bread pudding just seems to hit the spot. Maybe they didn’t get enough mushy food in their infancy and find the texture to be nostalgic. Or maybe their mouths are quite lazy in general, and welcome the minimal effort required to enjoy a bit of bread pudding. Or maybe they just don’t have flaky crusts on the brain at all times, and don’t think that a real dessert has got to have stamina, poise, and presence that, in all honesty, seems to be what’s missing from bread pudding. Now all that said, this bread pudding is quite good. Hard to go wrong with fresh cherries, and the cinnamon and vanilla add a lot of nice flavoring. I think I might skip the almonds if I baked this again. Their presence ends up being a bit distracting, since the texture is so much harder and crunchier than the rest of the dish. Perhaps walnuts would do better, since they would soften a bit more easily and blend into the pudding. Or maybe it would be best to sprinkle them on top. In any case, this is a very simple dish that is versatile and easily changed to suit the dietary and seasonal options available to you: use milk and egg instead of almond milk if making non-vegan; switch out the cherries and peaches for plums and blueberries; don’t use nuts, or use a few varieties of them. At the end of the day all you are doing is just throwing a bunch of things in a dish with soggy bread and baking it for awhile. Nothing glamorous, but if you can find the flavors and textures that work for you, I can see how this dessert might easily become a loved favorite. Mix almond milk, sugar, salt, cinnamon, vanilla, and vegan butter in a saucepan over low heat and warm just until the butter melts. Meanwhile, grease a 9×13 inch baking dish with butter, and fill with bread pieces. 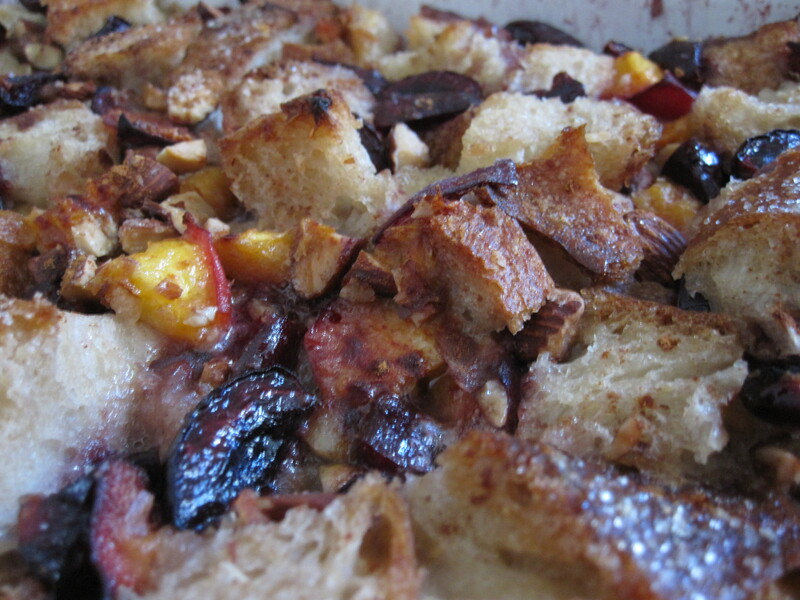 Add cherry, almond, and peaches to the bread and gently mix. Pour almond milk mixture into the dish and let sit for 10-15 minutes to allow liquid to absorb. Sprinkle a little cinnamon and sugar over the top and dot with a little butter. Bake for 45-60 minutes, until a knife inserted in the middle comes out clean. Allow to cool before serving. I recommend serving with whipped cream or ice cream! 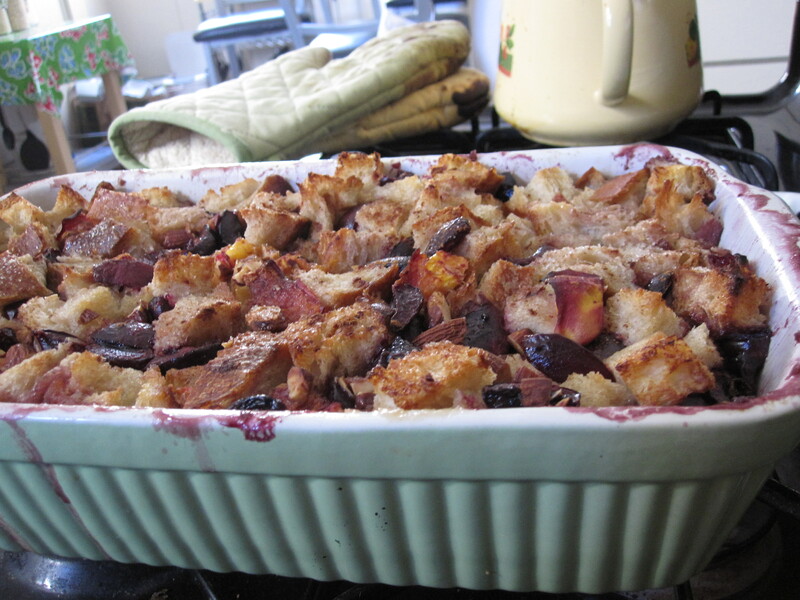 This entry was posted in Not pie, Vegan and tagged almond, bread pudding, cherry, peach, vegan. Bookmark the permalink. Try sourdough bread! 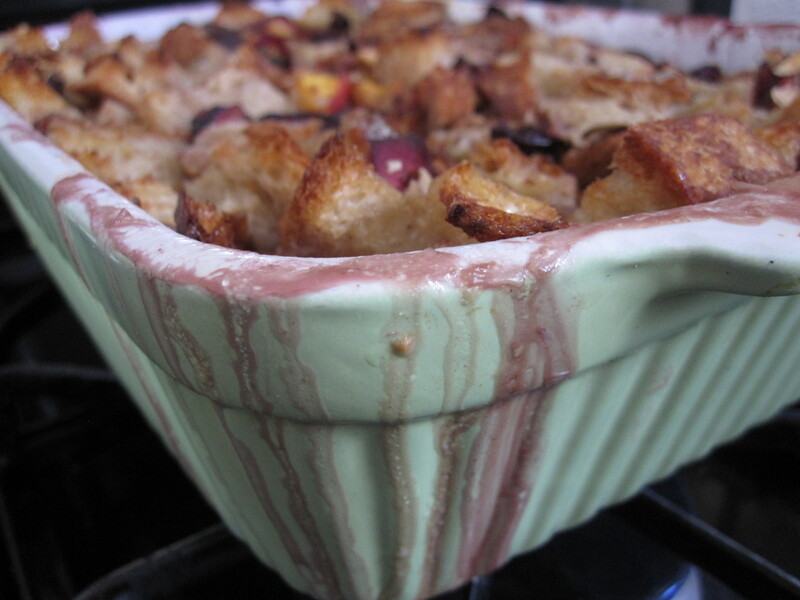 best bread pudding I’ve had uses sourdough… the sour and the sweet make the best combination. so, i made my first pie crust (destined to be apple pie with apples from momzo’s tree) tonight and you were my inspiration. you and joy the baker. i think i put too much water in.